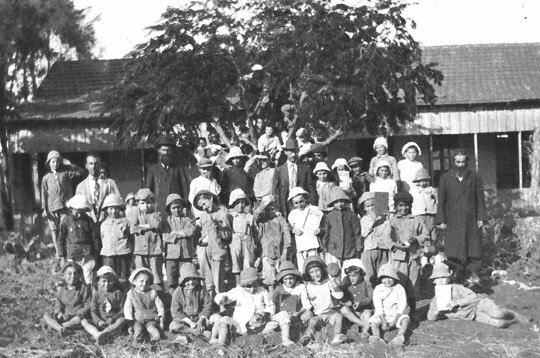 A school house in Rishon LeZion with students and teachers. 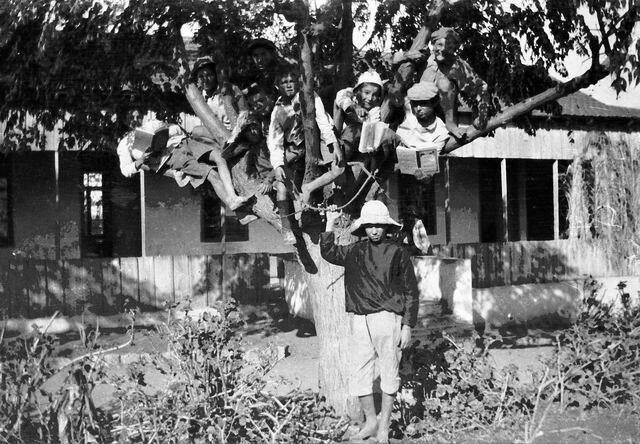 The picture was taken by Trooper Charles Thomas Broomfield of the New Zealand Mounted Rifles after the November 14, 1917 battle of Ayun Kara and the liberation of Rishon LeZion. Rishon was founded on July 31, 1882 by Russian Jews who had purchased 835 acres from the Arab village of Ayun Kara. 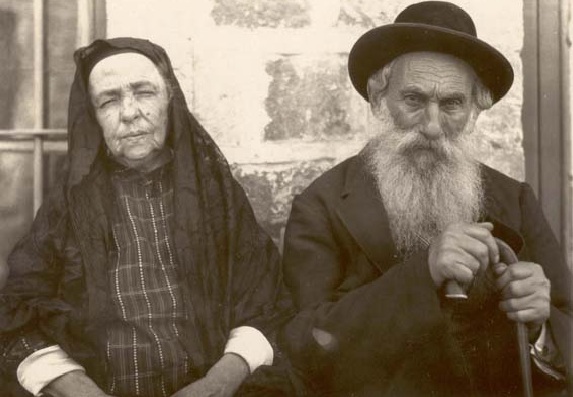 Israel Daily Picture was founded two years ago after we discovered 22,000 newly digitalized antique pictures of the Holy Land in the Library of Congress. medical archives in the Dundee Scotland Medical School, or from the "Cigar Box Collection." We also thank the New York Public Library, Harvard, Getty, and Eastman collections for allowing us to view their antique and digitalized archives. Families have also shared with us their grandparents' photos found in their attics. Charles Thomas Broomfield was born in the Coromandel area [of New Zealand], second son in a family of seven. Charles was twenty years old when he signed up for service on 27th November 1916. At that time he was working as an engine driver in Whangarei. Charles was part of the 26th Reinforcements, Mounted Rifles. Charles embarked from New Zealand on 31st May 1917 aboard the Union Steamship Moeraki. 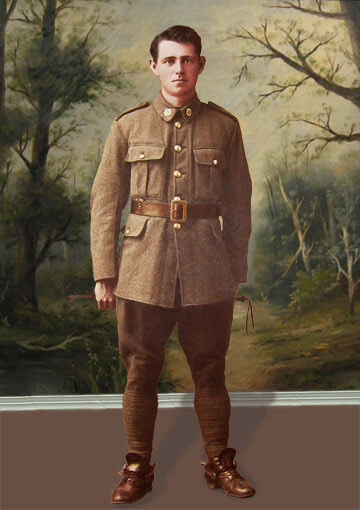 He was one of 262 New Zealand service men headed for Suez, Egypt. The Regiments transhipped at Sydney onto the Port Lincoln.They arrived at the Port of Suez on the 6th August after a stopover in Colombo, India. From Charles' records it is established that he joined the action in Egypt/Palestine about 28th September 1917 as part of the Mounted gunners section and was in action throughout the Middle East. He returned to New Zealand on the Kaikoura on 6th March 1919 after spending 1 year 324 days overseas. On return to New Zealand Charles lived with his parents in Whangarei . He married in 1923 and worked and raised a family in the Whangarei area. Charles died in Whangarei in 1949. After the action at Ayun Kara on November 14th 1917 the NZMR passed through the settlement of Rishon LeZion the following morning. 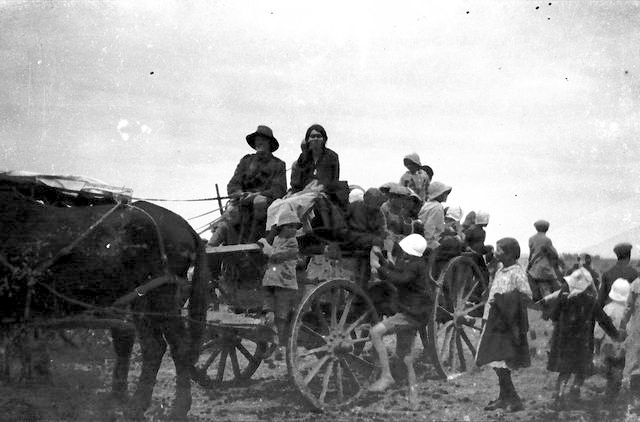 The people and the settlement was to have a strong influence on the New Zealanders. The Jewish village was the first taste of something closer to the environment of home. disappeared. Destroyed by whom and when, nobody knows." Since crossing the arid Sinai Desert and its confrontation with a hostile Turkish enemy and, more often than not, a treacherous contact with Arab Bedu tribesmen - The Auckland Mounted Rifles agreed it was a joy to meet a people who had just been freed from Turkish tyranny. It was a land worked into agriculture and planted with fruit trees and vineyards. Not only were the men taken with the settlement conditions, the horses too were impressed and ate heartily of green feed, and enjoyed the soil firm under foot. 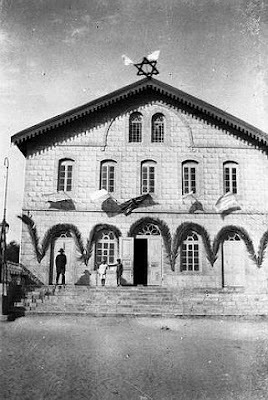 A few weeks later the Regiment remembered the village, the official history "Two Campaigns" reported: "On January 12, the brigade moved north to Rishon LeZion, the Jewish village near to Ayun Kara, and there tents were provided, and training and football again became the normal life." The NZMR history notes, "The date 14th November 1917 is the greatest day of action carried out by the Mounteds. The attack on the strongly fortified Turkish trenches near the town of Rishon LeZion in present day Israel is a story of guile, courage and great daring against a superior force." 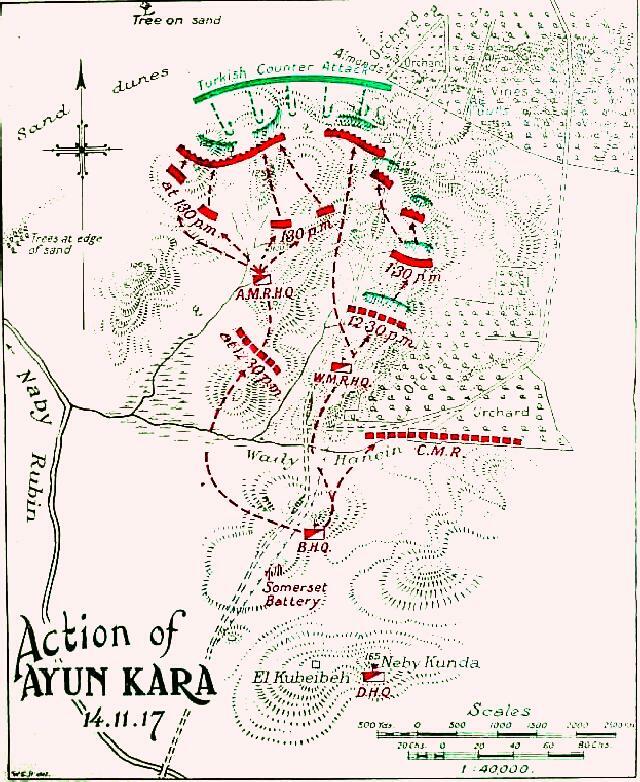 "The Action at Ayun Kara on the 14th November 1917 was carried out by the New Zealand Mounted Rifles on heavily entrenched Turkish defences. This successful rout of the enemy is remembered for its daring frontal rush by mounted troops and tactical movements in support by the brigades riflemen and machine gunners." LeZion on their way to the memorial service? "A quarter of an hour passed and we shall see all the Turkish armies climbing the mountains above the village, fortifying themselves in their defence trenches. At the ninth hour exactly the first shots were heard from the side of the Turks. There were more after any minute that passed. Suddenly the English started firing and their bullets crossed above our heads making a buzz and whistle that the death (angel) is a coming. At the first hour of the battle we were terrified and exited, but soon we were used to the shooting and we shall climb a high balcony from where we see the spectacle of war. Once in a few minutes we could hear the thunder of English guns and shortly afterwards seeing it exploding over the Turkish soldiers. All sounds of war turned into terrible furious anger of God, smoke, blood and clouds of smoke. After tough fighting we saw the Turks leave their first positions and retreat. 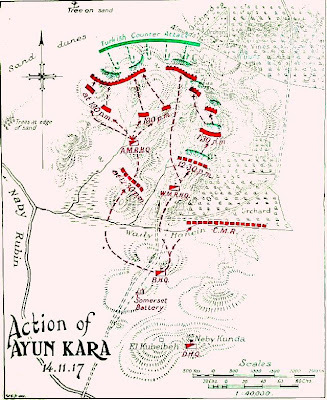 Line after line they were running down the mountain's crest with shells exploding between their lines, many falling dead and the remaining running exhausted to find shelter at the Orange groves. Now on the position the Turks had retreated from, we already see the English stand shooting their machine guns bullets of death with no break on the escaping Turks. An hours passed, and another one, and all Turks left the ridge of mountains, running north. At the third hour after noon the first of the English got in the village. We all hurried in joy to meet our saviors to which we waited for three years. They soon left the village, heading further to push the enemy back. Shooting went non stop, until darkness fell. After the shooting [ceased] the country was covered with English (New Zealanders) and much were we happy. I went for a night sleep with my heart full with joy and hope for the future, but then I could not fall asleep for the cry and moan of the casualties could be heard even from distance, begging for help. 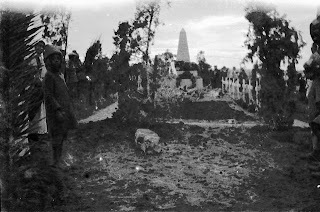 The next morning some of our village we went the field of death to collect the wounded. What a terrible scene it was! The mountains that were always covered with green grass and beautiful flowers, where shepherds were herding their sheep, were now covered with the dead, wounded and blood here and there. Dead Horses, rifles lying on the ground and crater everywhere from the shells. Smell of gun powder and dynamite everywhere. 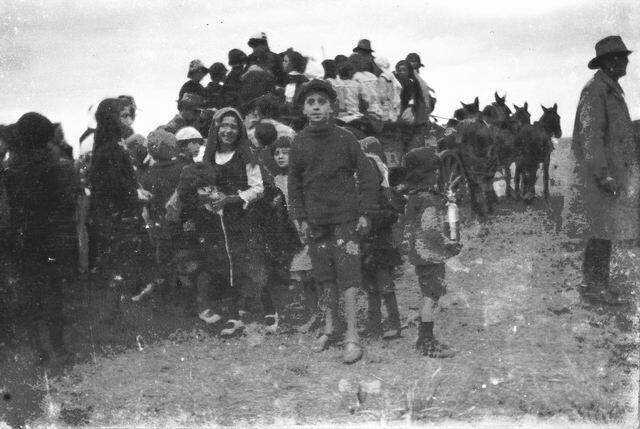 The wounded were collected and we shall send them on the camels of the English to the hospital that was [opened] in Rishon." These photographs and commentary are most fascinating. Please continue with this. Thank you for this post - by the way. Other pictures of this memorial (taken from close range) revealed that it was made of wood (you can see the texture and the vague lies where the wooden plates were connected to each other) thus its survival and disappearance are less of a mystery. It might have been removed by the workers who performed the “concertation” of the graves to Ramleh CWGC cemetery during the 1920’s, or earlier than that due to exposure to the weather which surely deteriorated its condition.